Cyrine wanted to change the logo and labels for her range of high quality, natural, organic Cyrine Aromatherapie skin care products. The range is hand-made with care, to organic standards by an expert aromatherapy masseuse. The focus is on wholesome products and ingredients and the packaging emphasis is on using recycled materials such as glass and paper. Clients receive a bespoke skin care product created by blending their chosen base with a hand-selected natural fragrance. Cyrine wanted the new branding to reflect her brand values and personality. Design the branding based on the colour palette of natural warm greens, brown, pink and ivory. Work with the current label sizes, which are customised and printed to order. Work with the current recycled glass containers. ‘Personalised Products. Naturally’ brings together product customisation with the natural source of the ingredients. It also adds the tone of authority for this unique range. The logo has a natural simplicity and the flower petal icon directly relates to the organic ingredients. The icon is also used as the website favicon. It symbolises a competent, confident and gently caring brand personality. 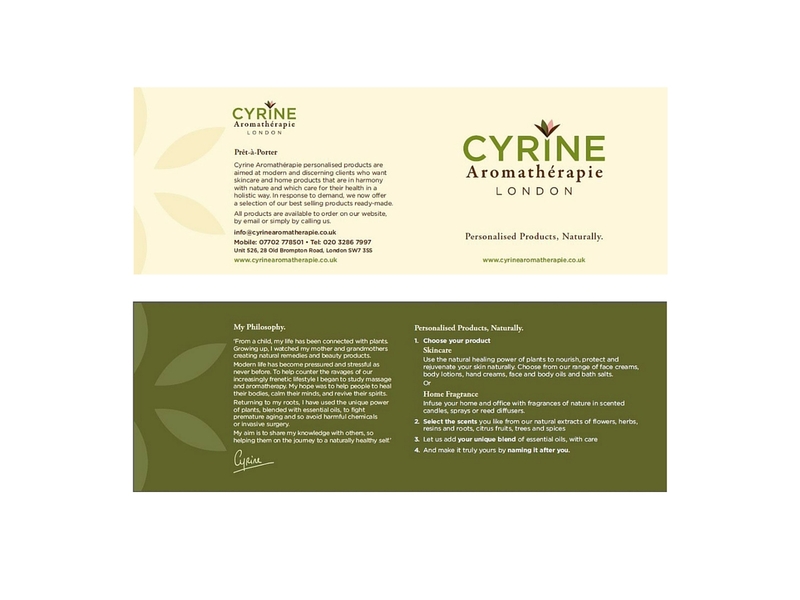 Previously, Cyrine Aromatherapie labels had been individually printed, by custom order and by pack size. This meant it took some time and effort to produce each label. We recommended a change to standard size labels, pre-printed with essential information which means the custom printing process is now faster and simpler.